P. Wollgramm, H. Buck, K. Neuking, A. B. Parsa, S. Schuwalow, J. Rogal, R. Drautz, G. Eggeler. 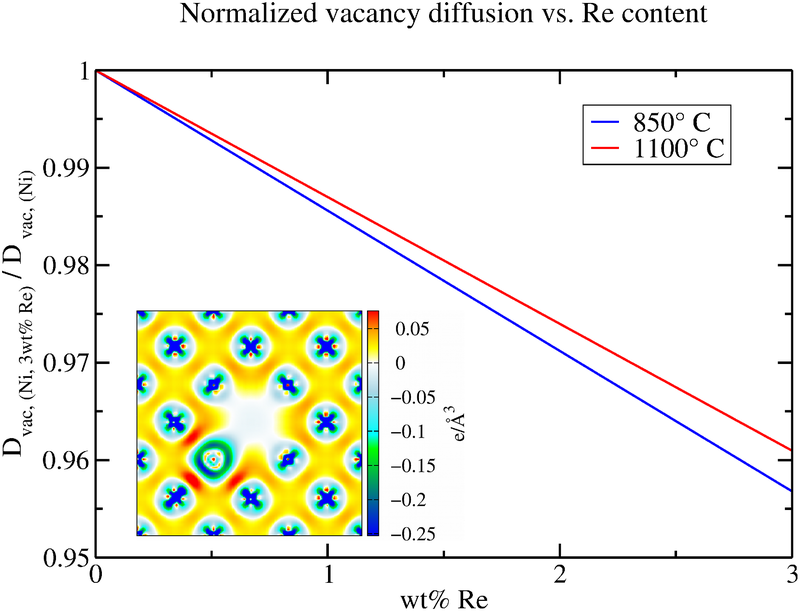 Normalized vacancy diffusion coefficient in Ni as a function of Re solute concentration for two different temperatures. The inset shows the valence charge density of a Re solute atom next to a vacancy in Ni. In the present study we investigate the creep behavior of a Ni-base single crystal superalloy. We evaluate the stress and temperature dependence of the minimum creep rate, which shows a power law type of stress dependence (characterized by a stress exponent n) and an exponential type of temperature dependence (characterized by an apparent activation energy Q(app)). Under conditions of high temperature (1323 K) and low stress (160 MPa) creep, n and Q(app) are determined as 5.3 and 529 kJ/mol, respectively. For lower temperatures (1123 K) and higher stresses (600 MPa) the stress exponent n is higher (8.5) while the apparent activation energy of creep is lower (382 KJ/mol). We show that there is a general trend: stress exponents n increase with increasing stress and decreasing temperature, while higher apparent activation energies are observed for lower stresses and higher temperatures. We use density functional theory (DFT) to calculate the activation energy of diffusion for Re in a binary Ni-Re alloy with low Re-concentrations. The resulting energy is almost a factor 2 smaller than the apparent activation energy of creep. We explain why it is not straightforward to rationalize the temperature dependence of creep merely on the basis of the diffusion of one alloying element. We show that the evolution of the microstructure also must be considered.